Hi friends! I am really excited to share with you that I am guest posting today over at Frosting for the Cause! the American Cancer Society to help find cures for cancers affecting women world-wide. After the year is finished, this project will have raised an astonishing $9,125 dollars to support cancer research from the bloggers alone!!! In addition, we will also donate our baked goods to our local women's hospice or hospital, to bring smiles to the faces of those suffering from this horrible disease. Head on over to the Frosting for the Cause site to read about how cancer has touched my life, and about how one very brave woman inspired my decision to purse a career in medical research. At one point or another, cancer will touch everyone's life; I hope that my story, and those shared by hundreds of other women, will raise your awareness and make you take a moment to think about donating even a small amount to help find a cure. You can donate directly to the Canadian Cancer Society or the Susan G. Komen Foundation, and keep in mind that every little bit counts. The recipe I chose to share for my guest post is a classic French palmier, brightened up with happy notes of citrus. This recipe is extremely easy to make, and it produces beautiful heart shaped cookies that are sure to bring a smile to the face of anyone who eats one. I am sharing the recipe here, but please don't forget to read the whole post (and see more photos!) over on the Frosting for the Cause site. Defrost puff pastry overnight in the refrigerator, or by leaving it at room temperature for about 20 minutes. Meanwhile, preheat the oven to 450 degrees Fahrenheit, and prepare a baking sheet lined with parchment or a silicone baking mat. Combine sugar, orange zest, and salt and mix well. Pour 1/2 cup of the sugar mixture on a flat surface, then unfold 1 sheet of the puff pastry on top. Pour another 1/2 cup of the sugar mixture on top of the puff pastry, spreading it out evenly. (There should be a thick coating of sugar.) Using a rolling pin, roll out the dough until it is a 13-inch square, making sure that the sugar on the top and bottom presses into the dough as you are rolling. Next, fold two sides of the dough halfway towards the middle of the dough square, then fold them again so the two folds meet exactly in the middle of the dough. Fold one half over the other half, as though you were closing a book; this will form a stack of dough with 6 layers. Using a sharp knife, slice the dough into approximately 1/2-inch slices, and place them cut side up on the prepared baking sheet, about 1-inch apart. Repeat the process with the remaining sheet of puff pastry and the remaining 1 cup of sugar. 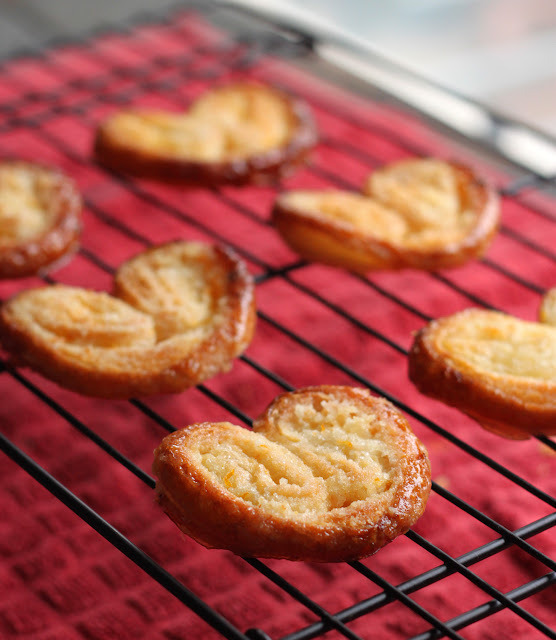 Bake the palmiers in the preheated oven for about 6-7 minutes, until the sugar on the bottom is caramelized and light brown. Then remove them from the oven and flip them over gently with a spatula, and return them to the oven to bake for another 3-5 minutes. Eventually they will be caramelized on the other side, but just watch the time because the sugar and go from light brown to burnt rather quickly. Transfer to a baking rack to cool, and store in an airtight container. Those look so perfect and I really like that flavor! 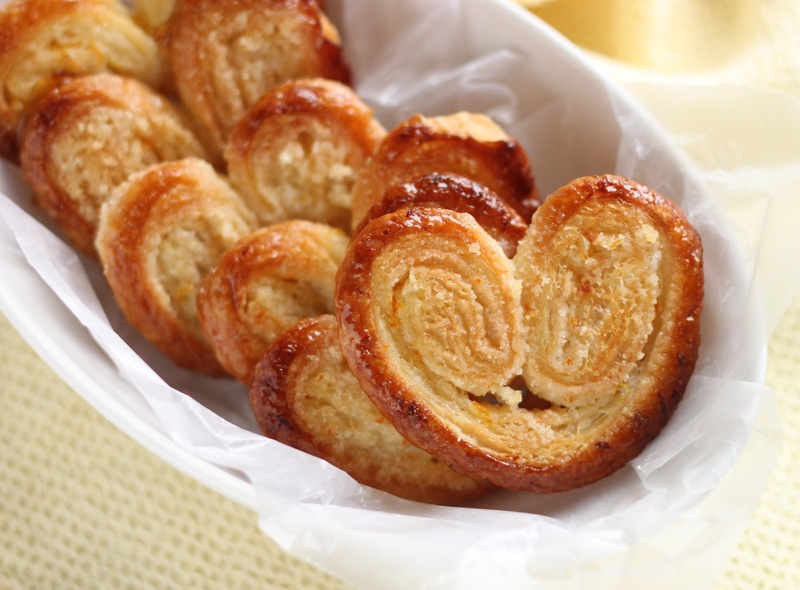 Simply Sensational Citrus Palmiers.... !!!!! The post is awesome and am totally in love with this post for noble cause and coming out with terrific idea of bringing smiles back with these sweet looking cookies. My hubby and the little one is also in love with these and want to give it a shot tomorrow. I will let you knw abt our experiment. Thanks for sharing the wonderful post, worthy of foodbuz top 1... !!!!! 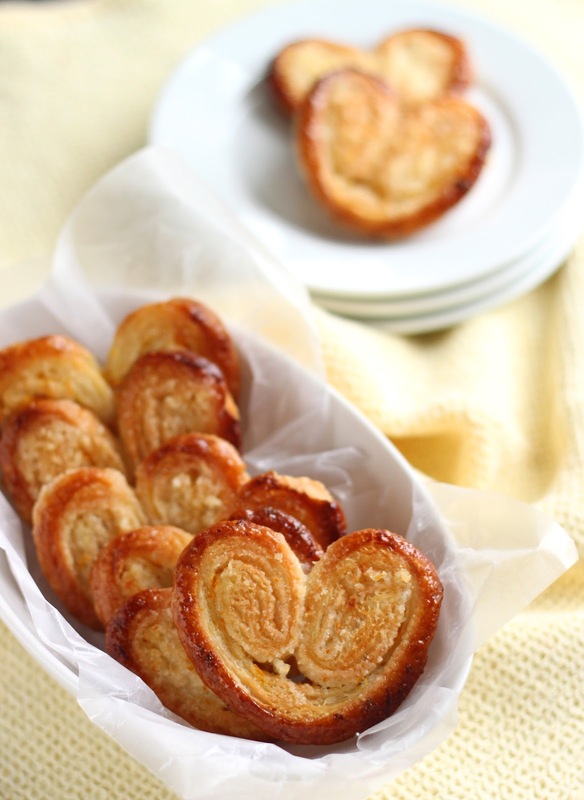 Perfect palmiers for a noble cause. I have lost the most special person in my life, my mom to cancer. will hop over to see the post. keep up with the wonderful work. These palmiers look and sound fantastic! What a great cause - I am going to click on the link! these look super delicious!! I love a good palmier! I love the idea of a flavored palmier! And for a cause that has touched my life very closely! Thank you for sharing! What lovely photos, definitely makes me want to reach into my screen and grab one! Thanks for raising awareness - and tempting our eyes! I love making Palmiers and yours are simply and perfectly gorgeous. I love this cause and you are so blessed to be a part of it. I would love to be involved in something like this! Oh these look and sound ah-mazing...and they are for a good cause! Lovely post. Wonderful post. I am happy to be a new follower. I've made these palmiers before but love your new twist. Beautiful photography as well. As a supporter of breast cancer research and education, I love to hear about how our food blogging community is working to make a difference! Thanks! Hi Amanda ~ How much I appreciate all your efforts in helping to bake a difference I cannot express. Thank you so much for volunteering for Frosting for the Cause and for sharing your inspirational story of the special nurse who inspired you to pursue the career path you chose. I hope she remains in remission and that she may someday see your beautiful tribute to her. Your Palmiers are beautiful and your post was the first time I've seen or heard of them! Thank you for helping to bake a difference. What an inspiring woman, so much strength and positivity in the face of adversity! Thank you for sharing the story, it's such a wonderful cause. What a wonderful post. It's wonderful that your supporting such an important cause. Gorgeous palmiers too! These are lovely! Great cause, too. Anything inspired by Ina is good in my book! You are a recipient of "The Lovely Blog Award". I adore your blog and appreciate all the hard work and love you put into your recipes! To see the award please visit http://oureyeseatfirst.blogspot.com/2011/03/homemade-series-3-grapefruit-marmalade.html and then pass it along to 15 other deserving bloggers! Congratulations! hm, yummi. i will try this next saturdy! in germany you can buy them with a dark-chocolate topping an we call them "Schweineohren" which means pig-ear. but i think elephant-ears fits better. this post was so touching. cancer changed the life of my family over night. I did not know about this blogging theme. Thanks Amanda. These turned out gorgeous and I love the addition of the citrus to the sugar. I can just imagine these with a refreshing sorbet in the summer - but really, who wants to wait that long??? What a beautiful and delicious treat for a great cause. I'm going to stop by. Amanda your story is lovely. I'm so glad she is still in remission:) I hope that one day you and your fellow scientist find a cure for this disease. Your palmiers do look like they would make even the most ill person smile. This is a great recipe. It is great you are participating. Your palmier are perfect and delightful, such a great cause as well! A little bit of everything: I am glad I could introduce you to Frosting for the Cause! If you are interested in participating you can still sign up! EnvieRecipes: Great to have you as a new follower!